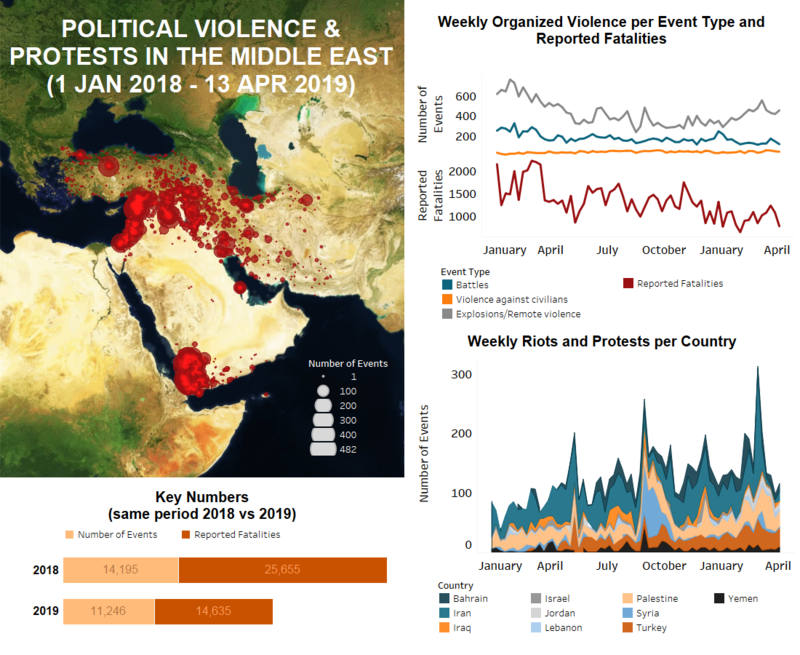 Key trends in the Middle East last week included regional backlash to Israeli actions and policies, ongoing labour demonstrations across multiple countries, and Kurdish conflict in southeastern Turkey. Massive flooding also continues to affect citizens of both Iran and Iraq and an ineffective state response is likely to be the catalyst for further conflict. In Iraq and Syria, the Islamic State (IS) insurgency carried on, while in Yemen there were some political developments despite intense fighting still occurring along the front lines. In Israel last week, Benjamin Netanyahu secured the votes necessary to maintain his position as the country’s Prime Minister. His party is expected to form a coalition with the same ultra-Orthodox and right-wing parties that they have historically been aligned with, indicating that a major shift in Israeli politics is not on the horizon (Washington Post, 15 April 2019). This retention of the status-quo is likely to affect the regional situation in a negative way, with many countries already expressing displeasure with Israeli actions and policies. For instance, demonstrations continued in Bahrain last week against the normalization of ties between Bahrain and Israel. In Jordan, demonstrations have also continued in support of King Abdullah II’s stance on Jerusalem and his country’s responsibility for the Muslim and Christian holy sites there. Jordanian trade unionists staged a sit-in in Amman in solidarity with Palestinian prisoners in Israeli jails, who have recently launched a nationwide hunger strike movement against their treatment. In Palestine’s West Bank, similar protests took place in Bilin. In the Gaza Strip, meanwhile, the ongoing Great March of Return attracted over 7,000 participants last week. They demonstrated against the Israeli blockade of Gaza and for Palestinian refugees to be allowed to return to their ancestral homes. A 15-year-old was reportedly killed east of Jabalya and over a hundred demonstrators were injured during clashes with Israeli forces who used live fire, tear gas, and rubber bullets to disperse stone throwers. The general conflict with Israel is also evident in Syria, where Israeli airstrikes targeted regime military positions with an Iranian presence last week for the second time this month. Among these targets was an alleged Iran-linked facility in Masyaf city, Hama province, believed to have been producing surface-to-surface missiles. The facility in question was completely destroyed, but had been previously targeted by Israel in both 2017 and 2018. The conflict between Iran and Israel has escalated recently following the latest round of cross-border violence between Gaza and southern Israel. Armed groups such as Hamas and Palestinian Islamic Jihad (PIJ) are known to receive support from Iran both politically and financially — with PIJ being considered by some to be a proxy of Iran (Haaretz, 29 March 2019). Furthermore, in an unprecedented move, U.S. President Donald Trump formally designated Iran’s Islamic Revolutionary Guard Corps as a Foreign Terrorist Organization last week, to take effect on 15 April. In response, Iran designated the United States Central Command (CENTCOM) in the Middle East — as well as all its affiliates — as a terrorist group itself (CNN, 8 April 2019). This has raised concerns about the possible risk of Iranian or allied retaliation against U.S. forces in the region (RFERL, 10 April 2019). Meanwhile, protests for better working conditions took place across several countries. Many of the demonstrators were led by government or municipal workers upset with their working conditions. In Iraq, hundreds of government employees protested in front of the Ministry of Health in Baghdad against discrimination and to demand better benefits. Municipality workers in Lebanon, meanwhile, demonstrated against delayed municipal funding and salaries. In Turkey, former public workers who were dismissed by legislative decrees during the attempted coup held a half dozen protests in Ankara, all of which were dispersed by police forces. In Iran, a number of demonstrations led by workers and retirees took place across the country, while employees in Jordan demonstrated for better worker rights and against a Ministry of Labour campaign to arrest 38 foreign workers. In Kuwait, recently graduated engineers who were not offered positions at the National Petroleum Corporation staged a protest in the capital for the third time this year. In Turkey, besides labour protests, there were a number of Kurdish-led demonstrations related to the election board appointing a runner-up Justice and Development Party (AKP) mayoral candidate to replace an elected Peoples’ Democratic Party (HDP) candidate. These occurred in at least three towns across southeastern Turkey. In the same region, at least four Provincial Governors declared multi-day bans on gatherings and demonstrations. Violent Kurdish opposition led by the Kurdistan Workers’ Party (PKK) also continued in the southeast, with a Turkish air operation against them occurring in Sirnak province for the first time in months. In another event, PKK militants reportedly threw explosives at a civilian butcher shop in Sehitlik, Diyarbakir, leading to property damage. As part of the ongoing Turkey-Kurdish conflict, Turkish forces continue to target PKK militants in Iraqi Kurdistan as well. In Iran and Iraq, massive flooding continued to affect dozens of provinces through displacement, loss of life, and billions of dollars in damage. While the flood waters have been receding in several regions, at least five Iranian provinces remain under flood warning in the south and northeast (Press TV, 14 April 2019). Demonstrations concerning the state’s response to the crisis have occurred in both countries, and are increasing in number as the immediate threat subsides. On Friday, hundreds of personnel from Iraq’s mostly-Shiite Popular Mobilization Forces (PMF) arrived in Iran’s Khuzestan and Lorestan provinces with the alleged intent to help with flood management and to limit flooding into Iraq. However, this event has sparked anger via social media, with some residents believing that the PMF’s appearance is proof that Iranian state forces are unable or unwilling to deal with the threat themselves. There are also claims that the PMF have arrived as a means of suppressing further protests (Radio Farda, 13 April 2019). On the same day as the PMF arrival, hundreds of Iranians took to the streets in Ahvaz, the capital of the oil-rich province of Khuzestan, demanding the diversion of flood water towards the Hour al-Azim marshes and away from populated areas. Again on social media, rumours have been spreading that the diversion has been delayed as a means of protecting oil facilities from damage; the Iranian Minister of Petroleum has denied these charges (Radio Farda, 13 April 2019). Elsewhere in Iraq, the Islamic State (IS) insurgency continues throughout the country, with violence involving the group almost doubling from the week prior. This increase is possibly the beginning of an operation by the group; their Amaq Telegram channel recently referred to several assaults as part of the “battle of revenge for the blessed state of Sham”. The vast majority of fighting took place in the governorates of Anbar, Sala al-Din, and Diyala. IS’ role in post-war Iraq has regressed to more discreet tactics involving mostly ambushes, IED and suicide attacks, and sniping. In Syria, there is a similar regression of the group’s tactics following the recent recapturing of IS-held territory, Deir-ez-Zor governorate, by Syrian Democratic Forces (QSD) and their Coalition allies (for more analysis on that, see this recent ACLED infographic). Last week, IS sleeper cells targeted both QSD and Global Coalition soldiers with assassinations and IED attacks in the governorates of Al-Hasakeh, Deir-ez-Zor, and Ar-Raqqah. Lastly, in Yemen the internationally-recognized government held its first parliamentary session in four years last week. The session was held in the city of Seiyun, Hadhramawt governorate, largely due to the Houthi occupation of Sana’a and the government’s inability to adequately control the security situation in Aden city (the temporary capital of the country) (Al Jazeera, 13 April 2019). Despite the deployment of reportedly hundreds of Saudi troops prior to the meeting, both violent and non-violent attempts to disrupt the session occurred throughout the week. On Wednesday, a Houthi drone was reportedly intercepted by Saudi anti-air systems over Seiyun as parliamentary members were arriving, and two more drones were intercepted the following day. Demonstrations were reported in both Seiyun and Aden, with the former being dispersed by pro-Hadi forces. Meanwhile, thousands of demonstrators gathered in Taizz city on Saturday in support of the internationally-recognized government and advocated for the return of the rule of law. Elsewhere, battles continued across all major fronts in Yemen, with an increased number of Houthi fighters reportedly being killed as a result of Saudi-led coalition airstrikes. Intense fighting took place in Damt district of Ad Dali, Nadirah district of Ibb, along the border areas of northern Sadah, and in all districts surrounding Hodeidah port city. UAE-backed forces also claimed to have taken control of new territory after pushing Al Qaeda (AQAP) operatives out of Wadi Al Himarah in Abyan governorate.